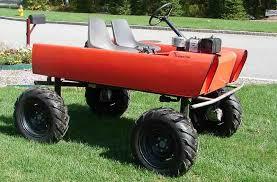 The Quadractor, manufactured in the 1970s and 1980s by Traction, Inc. in Vermont. The quadractor has a vertical shaft gear train originally developed by William Spence for using in aircraft landing gear, who designer of the Quadractor and founder of Traction, Inc. The tractor operates through four identical vertical drives to the wheels, and is therefore continuously in four wheel drive. This drive design allows for the lightweight Quadractor (around 500 lbs) to pull loads up to two tons. Spence wanted to create a tractor that was lower cost and that used less fuel than conventional tractors with comparable workloads, and be highly dynamic (also that had really good traction, hence the company name he came up with). Though the tractor been used most extensively for logging, it can be used with cultivating, rototilling and plowing implements that are attached underneath the tractor rather than behind, the weight of which are distributed to all four wheels. Though the quadractor is no longer being manufactured, there is a community of users restoring, retrofitting and using the quadractor for their small farming operations, homestead and woodlots. These users can exchange and dialogue on the tractor, modifications and implements through a user Forum. Specs and more information at www.quadractor.com. Read a more detailed account of the quadractor and its manufacture in this 1979 Mother Earth News article by Bill Rowan.